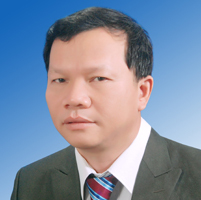 Nguyen Van Thanh currently holds the position of Finance Manager of Project RENEW. His main tasks are to provide a wide range of finance which include controlling the adherence to finance procedures, accounting, etc. He earned a B.A degree in Financial Accounting at Hanoi National Economy University in 1993. Before joining RENEW, he had eight years experience working as an accountant and then chief accountant for Quang Tri Construction Number 1 Ltd Company and Quang Tri Trade Company respectively.